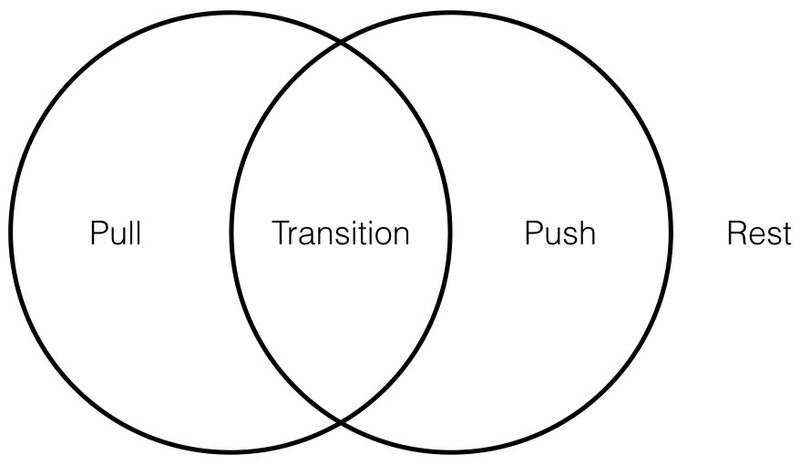 Pull (toward/inward) and Push (away/outward) are opposites (directionally). Having nothing in common, they are shown in the outer crescents exclusively. An active turning point must exist between these functions. This turning point involves both of the opposites, linking them together across a single spectrum. By including the Transition, the opposites, Pull and Push, are revealed as the extremes of a continuum, differing by degree, rather than by kind. In the aforementioned chapter, PTPR was revealed in the process of breathing. Inhalation Pulls oxygen inward and downward into the lungs, and, in reverse, exhalation Pushes CO2 upward and outward from the lungs. Between these directionally opposite movements, there is a Transition, in which oxygen is exchanged for CO2. As seen above, three actions are displayed in the two circles of the Pragmatic Schematic, while outside and beyond the PS is a Rest. If we carefully attend our process of breathing, we can perceive this Rest between individual breaths. In each of the four seasons, the Mother and Father dance together rhythmically, staggering their PTPRs so that their Pulls and Pushes align and their Transitions and Rests align. 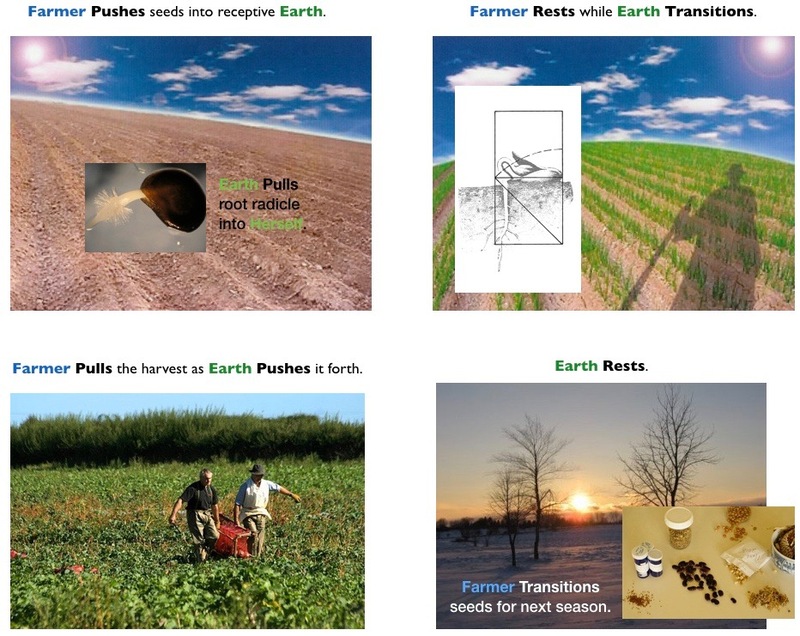 As we compare the four seasons, as shown in the photos above, with how they line up in our trusty Pragmatic Schematic below, we note that the two different relationships (as established in Divine Divisions) enjoyed by the Mother and Father are more apparent in the graphic than in the photos. In the photos, the Female Pushes visibly ripe produce from the plants, to be harvested by the farmer (Male Pull). In the spring photo, however, the processes are invisible. 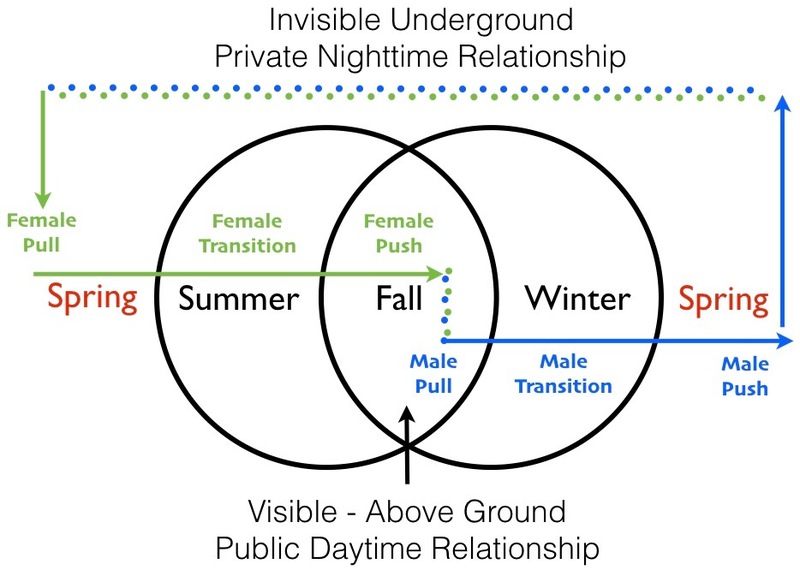 The Female Pulls the Male‘s seed and secretly prepares it to grow and produce. Ensconced in the warmth and darkness of the Mother, the seed is invisibly Transitioned into a productive plant. 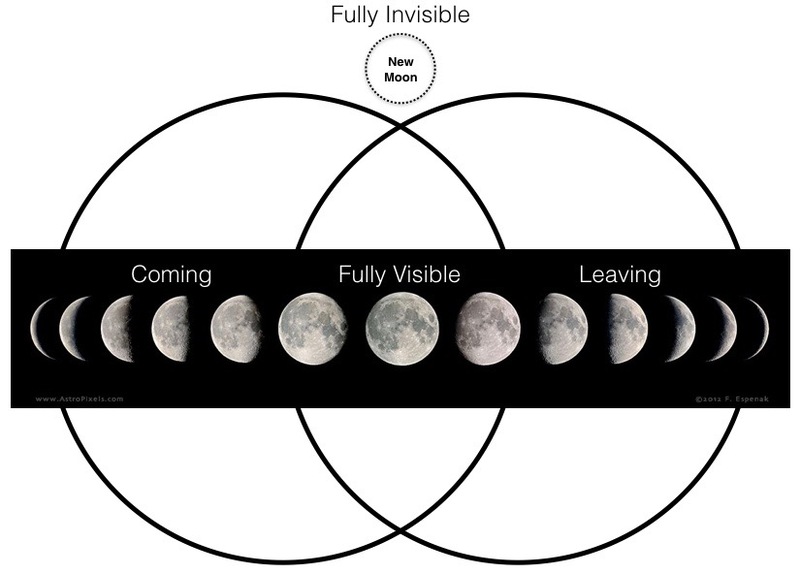 Like the story of the seasons, delivering visible produce from invisible potentiality, the moon cycles from invisibility into visibility and back again. The earth rotates on its axis, completing a cycle in ~24 hours. During this rotation, part of the earth is bathed in sunlight while the rest is cloaked in darkness. The sun does not rise and fall as it appears to do from our vantage point; instead, we rotate out of, and into, our own shadow. The sun is ~93 million miles from earth whether our place on earth is temporarily facing toward the sun or away from it. The moon’s cycle around earth takes ~28 days. During this span of time, the moon is said to wax and wane, though it does neither. The moon retains its size and shape throughout its cycles. The moon rotates on its axis once in the same time it takes for it to revolve around Earth. This means that always the same side of the moon faces Earth. Half of the moon is always lit. When we see all of the half-moon that is illumined, we call it a full moon. When we see all of the half-moon that is unillumined, we call it a new moon. During other times of the month we see varying degrees of the moon’s dark and lighted sides. 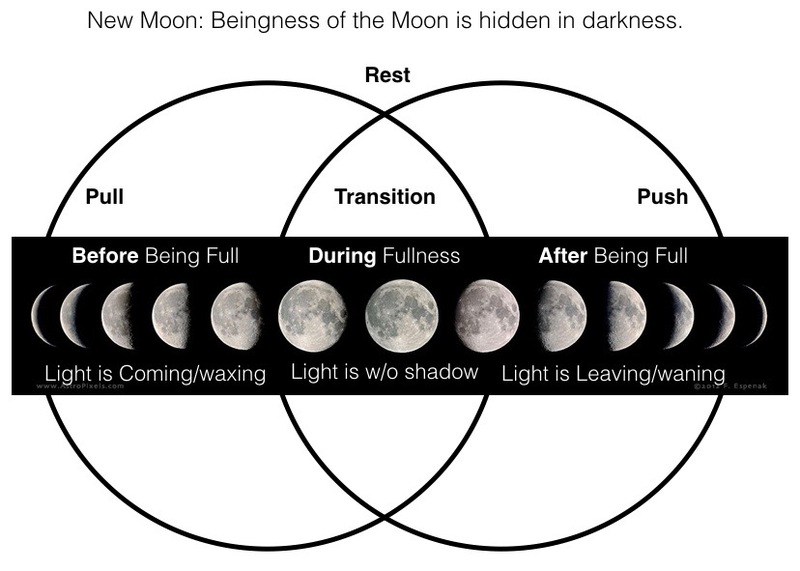 In showing the moon images, arrayed across the PS, its entire cycle appears in a linear advance, waxing from the beginning, reaching fullness in the center, waning toward the end, and then Resting until the next cycle begins. The moon has helped us recognize that just because something is unseen does not make it unreal!